Rodale Press is the organization that brings us Organic Gardening Magazine. 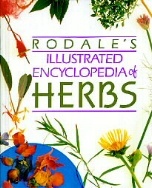 Rodale's Illustrated Encyclopedia of Herbs is much more than just an encyclopedia of herbs. In addition to the hundred plus individual herb pages, there are sections on cooking with herbs, companion planting and medicinal uses. One of the really nice features is the zone information and pH measure for each plant. It was here we learned why we were having a tough time with Arnica montana. It likes a pH of 4.5 and our soil is usually around 6.5 or 7.0.